Violence and war have raged between Zionists and Palestinians for over a century, ever since Zionists, trying to establish a nation-state in Palestine, were forced to confront the fact that the country was already populated. Covering every conflict in Israel’s history, War over Peace reveals that Israeli nationalism was born ethnic and militaristic and has embraced these characteristics to this day. 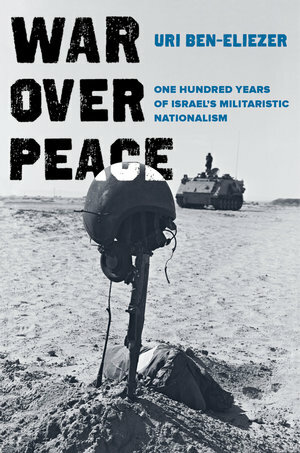 In his sweeping and original synthesis, Uri Ben-Eliezer shows that this militaristic nationalism systematically drives Israel to find military solutions for its national problems, based on the idea that the homeland is sacred and the territory is indivisible. When Israelis opposed to this ideology brought about change during a period that led to the Oslo Accords in the 1990s, cultural and political forces, reinforced by religious and messianic elements, prevented the implementation of the agreements, which brought violence back in the form of new wars. War over Peace is essential reading for anyone who wants to understand the role of ethnic nationalism and militarism in Israel as well as throughout the world. Uri Ben-Eliezer is a political sociologist and Professor and Chair in the Department of Sociology, University of Haifa. His publications include The Making of Israeli Militarism and Old Conflict, New War: Israel’s Politics toward the Palestinians.